"Reptiles? Why would anyone have a reptile pet?" is a question I'm often asked. While not for everyone, many provide a welcome opportunity for those whose allergies prevent them from having mammals or birds. That wasn't my problem when I got my first snakes, but reptiles are one of the few types of animals I can now be around. Nothing in my past prepared me for my future as it unfolded over the past decade. I began with having the time and financial cushion to stop working and pursue personal interests. I was having a blast studying animal behavior observation and health, working on oil spills, working with dozens of species in wildlife facilities, and visiting classrooms with a variety of animals to teach kids about vertebrate taxonomy. Quite a change from eighteen years in an office! All too soon, the exposure to the crude oil took its toll on my body and brain, including the limbic system. How ironic to later find that this part of our brain is sometimes referred to as the "reptilian complex!" In one calamitous year, I lost my husband to cancer and became too allergic to mammals, and later birds, to continue to work with or anywhere near them. There I was, with two Burmese pythons, searching for answers to my health problems and wondering what to do with the rest of my life. The Centers for Disease Control and Prevention estimates that as many as 3 percent of households in the United States have reptiles. The CDC's interest in these numbers stems from the increasing incidence of reptile-related Salmonella infections, to which the very young, elderly and immunocompromised individuals are susceptible. As time went on, I started volunteering to help the local herpetological society with their educational outreach programs. After acquiring a few more snakes, I decided to get a lizard, thinking that something with legs and ears would be a nice change. Enter Wally, my first green iguana. The more I read in the reptile pet literature, the more I realized how much of it was wrong, especially when it came to iguanas. I gradually realized that I could focus my animal health and behavior interests on reptiles instead of mammals and birds. Indeed, the more events I did, the more I realized there was a serious need for accurate, up-to-date information on what was fast becoming a major segment of the pet market (in 1996, 2.5 million reptiles were imported, including 1.25 million iguanas). By 1995, I had 53 reptiles: snakes, lizards, turtles, tortoises, lizards, including, at one point, 22 iguanas. I was doing occasional school and event programs, typically taking 15-20 reptiles with me as teaching assistants. I had been online for two years by that time and had compiled enough information to launch a website. I went back to school for a master's in education, doing my thesis on classroom reptiles and writing a teacher's guide to classroom reptiles. Working on the thesis, however, pushed my health over the edge into total collapse. It forced me realize that, physically and financially, I could no longer lecture nor maintain all of the reptiles. One of the hardest things to do was to do what I swore I never would do: find homes for my companions. Fortunately, I was able to place most of them with others who include reptiles in their education programs. Although I know I made the right decision under the circumstances, it is one that continues and will always cause me distress. I kept several lizards who had serious health problems, but I also kept a few other reptiles, the ones who made me smile or gave me comfort. 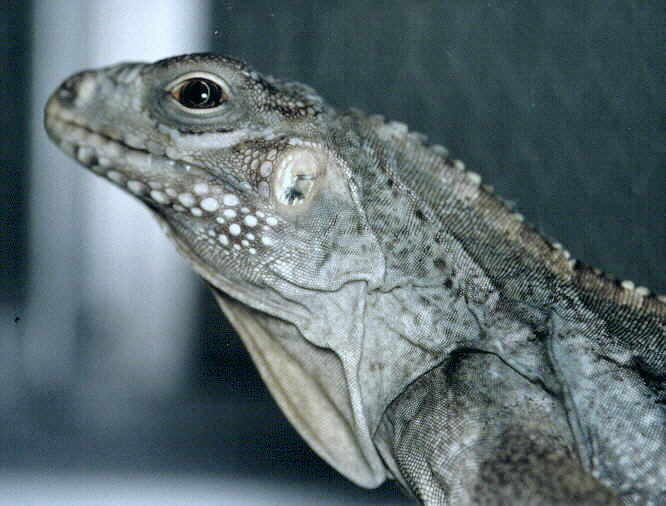 Wally, my first iguana, was sweet and sociable. While he did not solicit attention, he was always ready for lots of cuddling. Used to my moods, he simply closed his eyes when I loudly vocalized my frustrations (okay, I screamed and cried) when not being able to do things I needed to do. Pogona was a paraplegic bearded dragon, having been fed improperly before I got him. He remained, almost to the end, bright-eyed and secure in his belief that he ruled the iguanas despite the preposterous difference in size. Sluggo, my blue-tongued skink, looks like he was put together from leftover parts belonging to other types of lizards. He trots along, belly brushing the ground, blowing soft sneezes into my ear when curled around my neck. The tortoises I kept for a couple of reasons. Chaca has been with me for years and is at ease and easy. Treppie, an outgoing desert tortoise, circles my ankles like a cat when he wants something, quite a feat for an 11 inch tortoise. Tumblina is a wee desert tortoise whom I am hoping turns out to be a mate for Treppie. Mr. Snake, a ball python, spends his days sleeping and nights alert for food, content to hang out around my neck and do some supervised exploring when I take him out. Wally died a couple of years ago, leaving a hole in my heart, both because I miss him and because I contributed to his early death, my neurological disorder having led to a miscalculated drug dosage causing a serious decline in his health. My remaining green iguana, Rugwort, almost dead when he came to me before his second birthday, is stunted and misshapen due to early malnutrition. He and Mikey, a Cyclura iguana, are now starting to get along with one another. As Mikey saw Rugwort getting petted and cuddled, he decided he wanted attention, too, and so has become much tamer in a very short period of time. Of course, it may be that Mikey wants me to not pay attention to Rugwort rather than actually wanting the attention himself. But since he can't hide his "happy" colors (blue emerging from beneath his light brown), I can always tell if he's enjoying it or not. Cold-blooded is just a way of life. Reptiles are dependent upon ambient air temperatures and focal basking areas to raise their internal body temperature. Each species has an optimum temperature range which enables their metabolism and immune systems to function properly. Knowing the species' thermal, dietary, and space requirements is just part of what it takes to keep reptiles properly. Learning to read their behavior and interact with them is another. I have found that one of the clues to successfully keeping reptiles is reading their body language and colors. When reptiles are portrayed in film and books, they are often just sitting there, or special effects camera work is used to make them appear terrifying to the uninitiated. Most reptiles are quite communicative once you learn the individual species' language of posture, movement, and color. I am fortunate that, while my illness has taken so much away, it has given me the time and opportunity to continue learning about subjects that interest me and to learn new "languages," making reptile - and new human - friends along the way. Without them, the transition from my old life to this new one would have been far more difficult.